Our biggest currency as a company and as a stakeholder is quality. It is through quality works that we continue to secure repeat business, harness and enhance our relationships with our partners, open up new horizons and build onto the next level”. These are the words of Vusi Motha, CEO of Nweti Construction. Nweti is a wholly owned black infrastructure construction company founded in 2008 with a genuine desire to contribute positively to the lives of others. The company currently employs 200 people directly and 150 through various trade sub-contractors. The company’s rapid growth trajectory to level 8 CEPE within a decade in the civil engineering construction area and expansion into various geographies within South Africa brought with it challenges and complexities that require a mindset change and clarity of the company DNA. Bridges and other related structures. “The quality of our works in the first phase of the Soshanguve project enabled us to secure repeat works in the second phase (currently in execution with expected completion in February 2019),” says Motha. 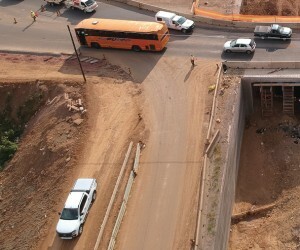 “In Mamelodi (east of Tshwane), we are expanding bridges and roads as part of the Bus Rapid Transport system (BRT) project. This project is extremely important as it is intended to improve ease of access into and out of Mamelodi, thereby driving economic activity that will hopefully reduce unemployment as well as a positive contribution to socio-economic development,” Motha continues. “We are extremely excited and humbled to have been shortlisted and appointed for a project of such significance. It is literally a gateway to economic activity into and out of Mamelodi. The beauty of our industry is that we create landmarks that will be there for generations to see and benefit from. We believe this Denneboom project is part of our auto-biographical footprint that we will always be proud of,” concludes Motha.